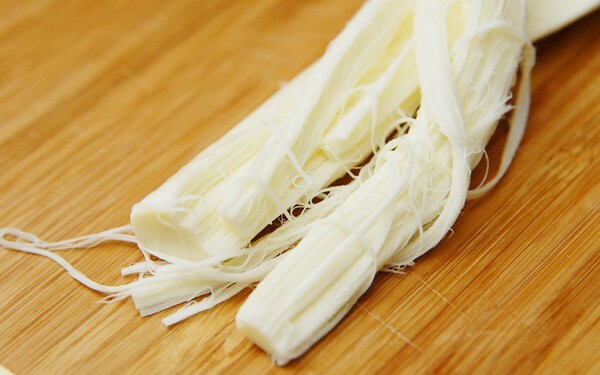 String cheese is peelable and when peeled, it becomes a form of strings or strips making it extremely popular to kids. The texture is chewy, firm and stringy. Pizza 4P's established their cheese factory in Da Lat in 2011 to supply fresh mozzarella cheeses to its own restaurant. At the beginning, they had to start everything from scratch- from finding a dairy farm to designing the product package. Today, they have more than 20 professional staffs and produce more than 400 cheeses everyday. Currently, there are two Japanese cheese makers working at their factory. Mr. Konuki is the founder of the factory and is in charge of the daily operation. Mr. Kubota studied cheese making in France for 6 years and received a French national certificate in professional cheese making. After working at a cheese factory in Hokkaido, he joined Pizza 4P's and is currently engaged in new product development. What's necessary about cheese making is fresh, high quality milk. At Pizza 4P's cheese factory, they use freshly produced milk from carefully selected farms and utilize low-temperature pasteurization to maintain its natural flavor. Also, their professional cheese makers craft each cheese by hand to create a soft and spongy texture. Once produced, the fresh batches of cheese will be shipped the same evening and arrive at the restaurant the next day. Unlike imported mozzarella that usually contains preservatives to keep its freshness, Pizza 4P's use absolutely no additives and produce 100% natural fresh cheese. 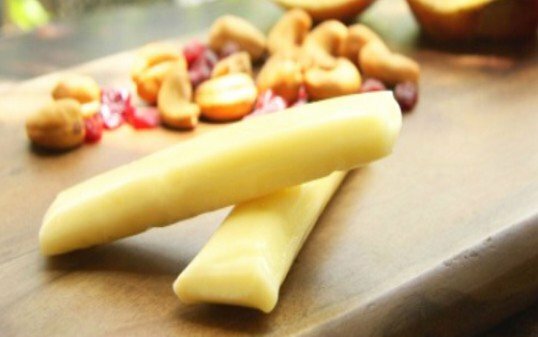 Since cheese is rich in protein, calcium, and many other nutrients, it is an ideal snack for kids. String cheese is peelable and when peeled, it becomes a form of strings or strips making it extremely popular to kids as well as adults. The texture is chewy, firm and stringy.